Start looking for great deals on the Samsung Galaxy J3 (2016) with TigerMobiles.com. For budget hand set shoppers, the newest Samsung J model has plenty to offer, from decent performance specs to an excellent screen, and some stunning design too! Ready to get a new phone for a great price? Then just check out our deals on the Samsung Galaxy J3 (2016) below. Samsung are one of the best known names on the mobile market, and whilst they’re probably better known for their high end Galaxy S and Note series, they do also have more budget friendly offerings. The most recent of these is the Galaxy J3 (2016), and with this model, Samsung are setting out to show that budget phones don’t have to be clunky and unattractive. Can you get a decent budget mobile that looks like a high end device? With the J3 you certainly can. Why should you invest in one? There’s solid performance, of course, but there’s also an excellent display, a satisfying camera set, and then there’s that design. 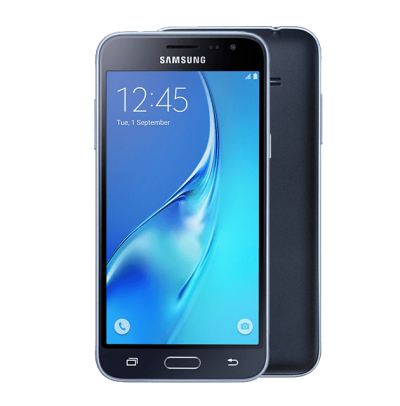 If you want a mobile that’s not going to break the bank but that’s still going to tick all the boxes, then you need to check out the Galaxy J3! We’ve already raved about the design here, but deservedly so. The J3 is slim line, with gently curved corners, and a real minimalistic look about it. The edging is metal, giving a premium quality feel, whilst the back panel is plastic, making it light weight and yet secure in the hand as well. In short, the J3 looks just like Samsung’s top end mobiles, and that’s no bad thing. Aside from the design, you’re getting some nice internals as well. There’s decent performance and camera specs, as well as a great screen. And whilst there isn’t much in the way of extras, this is a budget hand set, and you’ll be getting more than you bargained for for your cash. Budget hand sets are nearly always a compromise, but here that compromise is small at best. You get a good looking phone with decent specs, all for a lot less than you might expect. So if you’re shopping with a budget, then the J3 should be right up your alley. Alrighty, let’s look at performance first, since that’s always the most important factor when buying a new mobile. The J3 gets quad core processing power, running a 1.5 GHz processor alongside 1.5 GB of RAM. For the average user that’s going to be more than enough to give you a speedy phone that’s responsive even when multi tasking. As we’d expect from a Samsung Galaxy, this is an Android device. Out of the box it runs Android 5.0 Lollipop, though it should be possible to upgrade that to at least Android 6.0 Marshmallow. Android gives you plenty of customisation options and control, plus it’s intuitive and easy to use, particularly when it’s coupled with Samsung’s TouchWiz user interface. Performance here is solid. These are pretty much the specs we’d expect to see at this price point, but that’s no bad thing, it just means you’re getting what you pay for. And put that performance into such a good looking phone, and you won’t be disappointed. Let’s move on now to that display, and we expect great things from a Samsung screen. You’re getting a five inch screen, so more than enough room for video watching or on screen typing. That also means that the J3 is easy to use with one hand, and that it’s more portable than larger screen phones, sliding easily into your pocket. Resolution numbers are slightly misleading. You’re getting 720 x 1280 pixels, so about 294 PPI, which doesn’t sound too impressive, though in fact the image is sharp and clear. This, and the excellent colour reproduction, is thanks to the face that the J3 has a signature Samsung Super AMOLED screen. In reality, the display on the J3 is bright, colourful, and a pleasure to look at, so don’t be led astray by those screen resolution specs. You’re looking at a top end Super AMOLED display, and image quality is excellent. Taking pictures with a mobile is far more convenient than having to carry a digital camera around, but only if you’re getting decent photography. Thankfully, the J3 has some very nice cameras. At the front you’ve got a 5 MP cam, which should be more than suitable for video calling or for taking the odd selfie. At the back you have a pretty standard 8 MP affair, which is really what we expect at this price point. You get f/2.2 apeture, autofocus, and LED flash, all of which should mean that you get some pretty solid shots. No, these aren’t the best cameras around, but then you’re not paying hundreds of pounds for a mobile. These cameras are very good for the price, and the pictures are surprisingly bright and colourful, so casual photographers should be more than happy here. This is a budget phone, so it would be unfair to expect a lot of extra features, but there are a few things worth mentioning here. Firstly, you do get 4G, so that’s extra fast mobile data if you have a 4G mobile contract, and that’s not something that’s quite standard on budget hand sets just yet. Then there’s NFC as well, which most people know better as the tech that lets you use mobile payment systems securely, again, not something that’s standard on budget phones. Finally, there’s sound quality. The J3 has rear speakers, rather than front facing, giving a nice, rounded sound, lacking the tinny audio you often get in front facing external speakers. By far the biggest selling point of the Samsung Galaxy J3 (2016) is going to be its design, it basically looks like the high end Galaxy S7. However, it does also offer decent performance, a very good display, and some satisfying cameras as well. If you want a phone that looks fantastic but that doesn’t cost a fortune, then the Samsung Galaxy J3 is going to be a great choice for you. Connectivity is pretty normal here, so you’ll get 3G, 4G, Bluetooth and WiFi. There are two versions of the J3 available, with either 8 GB or 16 GB of internal memory. However, storage shouldn’t be an issue since the J3 does have an SD card slot for up to 256 GB of additional external memory if necessary. Right, what don’t we like? It’s kind of picky, but the J3 doesn’t have automatic brightness, you have to manually adjust screen brightness which can be a pain if you frequently use your phone outside. But really, that’s a pretty small thing. On the whole, we think that the J3 is a great phone for the price, and a very, very attractive one. If you want a mobile that looks high end but that is still affordable, then it’s got to be the Samsung Galaxy J3 (2016)!